More than 44 million people attended the New York World’s Fair in 1939 and two of the many exhibits that visitors would have enjoyed were the Glass Center, a pavilion that marketed glass as the material of the future, and the Town of Tomorrow, a faux suburb of model homes that included the House of Glass. 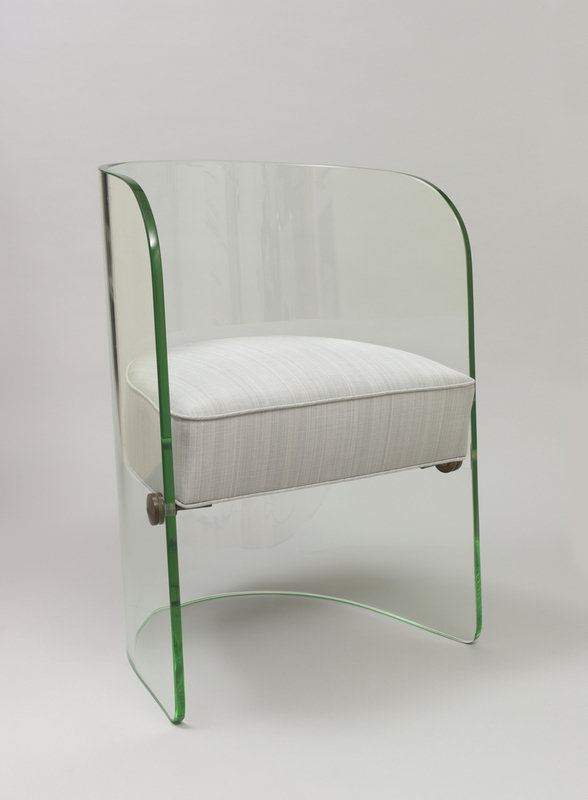 In both of these venues an example of this sleek glass chair, manufactured by the Pittsburgh Plate Glass Company, would have caught the visitors’ eyes. Plate glass had become synonymous with urban progress through its expansive use in shop windows and in skyscrapers including the Empire State Building, whose architects, Shreve, Lamb & Harmon, were also responsible for the Glass Center pavilion at the World’s Fair. Inside the pavilion, decorative panels depicted the history of the industry, looms wove fiberglass goods, and a crew of glass blowers worked at a furnace of molten glass. The Pittsburgh Plate Glass Company showed a model room in which six examples of this rounded chair, with fiberglass upholstery, complemented a glass table, a glass sideboard, crystal tablewares, and mirrored walls. Here the manufacturer aimed to show visitors how this industrial material of glass could glamorize and modernize the home. To commemorate their experience, fairgoers could have picked up the brochure entitled “The Miracle of Glass: Its Glorious Past, Its Thrilling Present, Its Miraculous Future,” a copy of which is held in the World’s Fairs Collection at the Cooper Hewitt Library. “Glass Furniture,” Pittsburgh Plate Products, January/February 1947, 8.